With just a few months remaining before becoming the Army's functional Lead Materiel Integrator, training and preparation are top priorities in Army Sustainment Command's Distribution Management Center. Launched by the Secretary of the Army in March, LMI is a complex, dynamic and unprecedented initiative. "The Secretary designated Army Materiel Command as the Lead Materiel Integrator, essentially giving AMC the authority to run the Army's materiel distribution processes as part of the Materiel Enterprise," said Maj. Gen. Yves J. Fontaine, ASC's commanding general. "As AMC's operational arm, we become the executing agent responsible for getting the right equipment to the right place at the right time." Success rests on two elements: achieving total asset visibility and devising distribution solutions to the Army's unit equipping priorities. 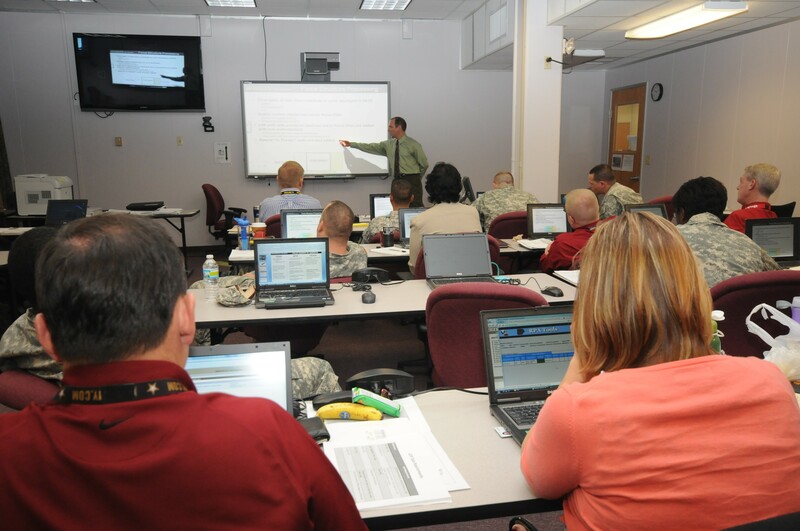 With AMC's Logistics Information Warehouse providing an authoritative asset database, it falls to a few dozen ASC Soldiers and civilians to work with higher echelons and supported commands to map a method of distributing available equipment according to the Army's equipping priorities. It's a formidable task, compressing detailed preparation into a matter of months. "We've run a series of exercises and rehearsals with participation by all stakeholders to map out our business processes. We anticipate assuming this very important mission by February," Fontaine said. While helping define the "what" of LMI, the DMC team is also learning the "how." To that end, a quartet of unit integrators from Department of the Army G8 Force Development Directorate conducted a training event Oct. 3 -- 7 at ASC's Rock Island, Ill., headquarters. "Some of what is becoming known as LMI is being done at DA G8," said Rodney DeMarre, one of the four DA trainers. "We came here to share our methods and experiences while training ASC people to detect the 'delta' between unit authorizations and equipping levels, then identify sourcing solutions -- all according to priorities established by the Department." "The DA trainers helped us establish a baseline, giving us the fundamentals to accomplish the mission," said Sgt. 1st Class Howard F. Armstrong, NCO in charge of DMC's Team 2, and one of 48 DMC participants. "We're in a unique spot," said Bob Michaels, a DMC supervisory unit integrator. "LMI is a concept until we make it work. So we have the rare opportunity to help define and refine the tools, rules and methods. The DA team helped us explore existing methods, providing a base for process improvement." Wanda Cover, a DMC unit integrator, also found opportunity in the training session. "We advanced from a spreadsheet process to a database process, which paid immediate dividends," Cover said. "The short-term payoff is streamlining our unit distribution plan production, which required hours of painstaking data integration into a spreadsheet. Using a database method, we can produce a UDP in barely half an hour, while reducing possibility for error." The long-term payoff, Cover said, is greater understanding and appreciation of the Decision Support Tool, an LMI software solution still in development. "By seeing and doing the steps that DST will automate, we have a greater understanding of what's taking place 'behind the curtain,'" Cover said. "When we are able to press the DST 'Easy' button, we'll have a solid grasp of the process -- and manual capability as a back-up." "I'm confident we'll get this right," Fontaine said. "We will rely on the automated DST to link requirements to the assets reported in LIW, helping us create distribution solutions based on Army priorities."